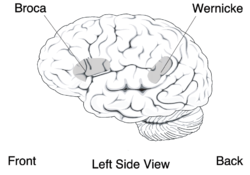 Wernicke's area is an area of the brain. It is one of the two parts of the cerebral cortex linked to speech (the other is Broca's area). It is involved in the production of written and spoken language. It is in Brodmann area 22, in the dominant cerebral hemisphere. The dominant hemisphere is the left in about 95% of right handed individuals, and 60% of left handed individuals. As with Broca's area, Wernicke's area was discovered by autopsies of patients who had speech difficulties. Carl Wernicke, a German neurologist, had a patient who could speak quite well, but was unable to understand the speech of others. After the patient's death, Wernicke found damage to an area at the upper portion of the temporal lobe, just behind the auditory cortex. He thought, correctly, that this area was responsible for speech comprehension. This kind of aphasia is known as Wernicke's aphasia, or receptive aphasia. "When you ask a person with this problem a question, they will respond with a sentence that is more or less grammatical, but which contains words that have little to do with the question or, for that matter, with each other. Strange, meaningless, but grammatical sentences come forth, a phenomenon called "word salad". Like Broca's area is not just about speech production, Wernicke's is not just about speech comprehension. People with Wernicke's aphasia also have difficulty naming things, often responding with words that sound similar, or the names of related things, as if they are having a very hard time with their mental dictionaries". Despite the fact that Broca's and Wernicke's areas are in different lobes, they are quite near each other. They are connected by a tract of nerves called the arcuate fascilicus, and by another recently discovered tract. ↑ 1.0 1.1 Boeree C.G. (2004). "Speech and the brain". ↑ "Aphasia: signs & symptoms". American Speech-Language-Hearing Association. ↑ Catani M. & de Schotten M.T. 2012. Atlas of human brain connections. Oxford University Press. This page was last changed on 28 June 2018, at 12:34.